Apple Blossom Festival and Ducky Wucky River Race! This year's Apple Blossom Festival and Ducky Wucky River Race will be held on Saturday, May 11. The Apple Blossom Festival is held on the Harvard Town Common. Food vendors and artisans will display their wares in a festive setting. The Ducky Wucky River Race takes place on the Nashua River in Harvard. Grand prize is dinner for two anywhere in the world! Purchase tickets now from any Ayer, Harvard, Shirley, Devens Rotarian, or online at duckywucky.org. Devens Dog Festival June 2, 2019 11:00 a.m. to 3 p.m. Rain or shine. 29 Antietam St. (Museum Field), Devens, MA. This event supports the Dogs2Vets Program. This annual fundraiser provides the vital funds necessary to support this program and provide much needed service dogs to Veterans. 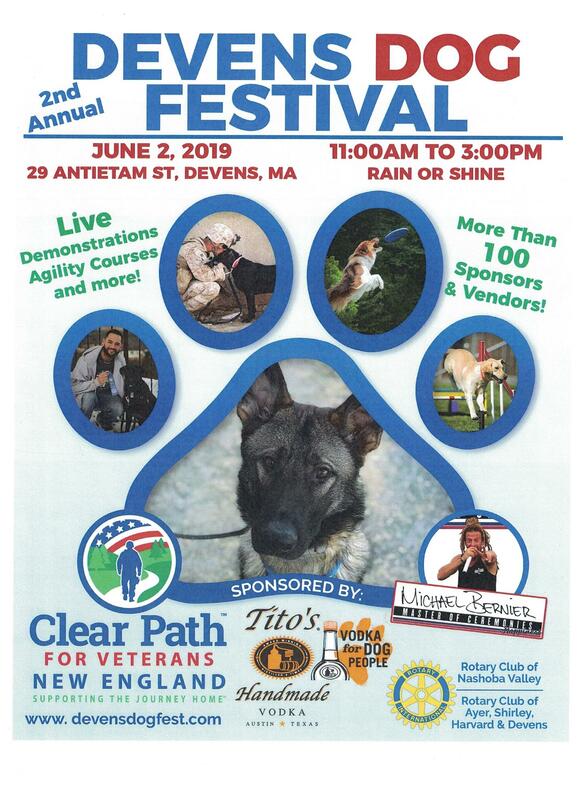 The Ayer, Shirley, Harvard and Devens Rotary Club has partnered with Clear Path for Veterans and the Nashoba Valley Rotary Club to bring this dog-loving fun to the area. Admission is $10; leashed dogs welcome. The Ayer Rotary Club will build wheelchair ramps for people in our community who need a ramp but are unable to afford one on their own. The Club is currently accepting applications from area residents. For more information, or to apply, please contact Patricia Thorpe at 978-339-3419, or via email pattythorpe@live.com. 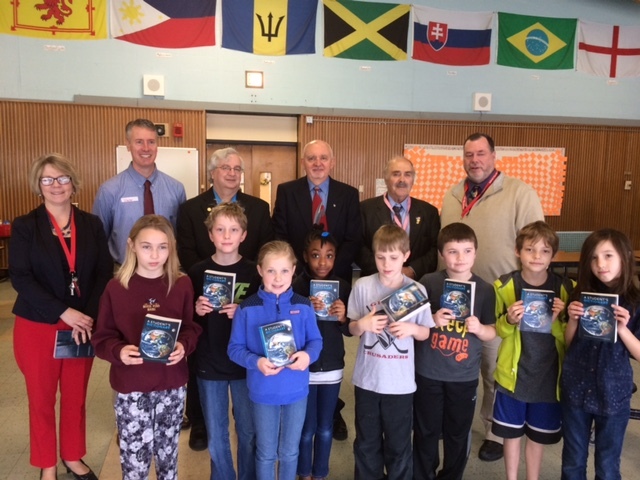 With proceeds from last year's Ducky Wucky River Race, the Ayer Rotary Club recently gave dictionaries as a personal gift to every third-grade student at the Page Hilltop School in Ayer. Third-grade students at the Page Hilltop Elementary School received personalized dictionaries from the Ayer Rotary Club during a recent class assembly, just one example of public service funded by the club's annual Ducky Wucky River Race. Inscribed with each child’s name, the dictionaries are a gift meant to help students improve their communications skills and encourage them to excel in school. “We are excited to provide a gift to each third grader to show them the Ayer Rotary Club and the entire community support their education and want them to succeed in school. We hope this will be the first year of a new annual tradition, and we thank the many individuals and sponsors who donate generously to support the community service work of the Ayer Rotary Club,” said Michael Phelan, the club’s president for 2015-16.